Picture perfect views from each window! This home is excellent for family gatherings as it sleeps 18! Up to 18 adults plus there is a kid’s bed and pack ’n play. Walk into the spacious entryway and kick off your shoes. This entryway opens up to a large family room with beautiful views. The dining room and kitchen are all open, making for a great place to relax and visit. Beyond is also a nice spacious sitting area with pullout sofa Smart TV & DVD player. The deck off of the sitting area is a host to outdoor tables and chairs, mountain views, the calm of the seasonal stream and the whisper of the breeze through the leaves on the trees. You can see the hot tub from the kitchen so you know when it's your turn! Break out the croquet set, soccer and volleyballs as the yard is 2 acres for playing! There is also a fully adjustable basketball hoop on site. For your enjoyment and relaxation there will be patio furniture by the hot tub, on master bedroom deck and on the main deck. From the entryway to the left there are two bedrooms down the hallway and the master suite is at the very end of the hall. There is a half bath across the hall from the bedrooms. Each bedroom also has its own full bath. The master suite has a TV and DVD player, a soaking tub and a separate waterfall style shower with tile and glass accents. There is a quaint balcony off the master bedroom with a view of Mt. Maurice. Next we have the mid-level which entails a spacious bedroom that sleeps 3 with a twin and a full bed and a 3/4 bathroom. There is also a laundry room with washer/dryer and access to the garage and the back door which leads to the hot tub. One more level to go! The lower level holds an excellent media room with a fully functioning smart TV, pool/ping pong table and surround sound stereo system. A bar area rounds out the entertainment area with a fridge, microwave, sink and dishwasher. Sleeping on this level includes one queen sized bedroom, one bedroom with 2 sets of single top and bottom bunks with conjoined full bathroom. Additional sleeping area with queen, single and kid’s bed. There is also a half bath on this level and if you need an office area, there is a space. For your "littles" there are two Pak 'n Plays and also a Little Tikes kids table that will seat 6 for indoor/outdoor use with an umbrellas! 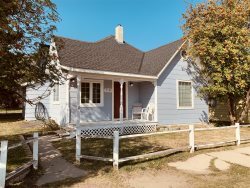 Two car insulated garage completes this wonderful home for your vacation in Red Lodge! Greenough Lake and Wild Bill Lake are both an easily accessible drive and short hike making it perfect for little ones to fish. Children under 11 years of age do not need a license. 12 and older non-resident can get a two-day pass for $25.00. Check with Red Lodge True Value for licenses and information. We hope you enjoy your stay at Moose on the Loose and make many wonderful memories! We welcome you to use this home to celebrate special life events. All guests included on the rental agreement are welcome. *Note on Lower Level: This level consists of one bedroom with one queen, one bedroom with two twin bunks, a bonus room with one queen, one twin and one child bed (if you are over 3' tall you won't fit in this bed). Main Level is full bath in master, each bedroom has it's own full bath. Mid Level is a 3/4 bath. Lower Level is jack and jill to two bedrooms with double sink vanity separate from the stool and shower. This level also includes a half bath. The house was beautiful and spacious. It was clean and well stocked with linens. Excellent experience. We plan to be back next March. Moose on the Loose was a beautiful home and great location. Perfect for socializing and playing and meals all together - SO spacious! We enjoy spending time in the hot tub and playing pool, ping pong and the cards and board games they had available for us. The kitchen was gorgeous and a great place for the group to work together to prepare meals and drinks and just have fun. The bedrooms all have connecting bathrooms and so amazing to have that feature! The bathrooms had cute little soaps and shampoos and plenty of blankets and towels were available. The property was very well kept and clean. A short drive to the ski slopes and the town of Red Lodge - it is on the edge/outskirts of town. We will definitely go back as great memories were made and no complaints about the property! Free WiFi was available. Convenient location,, lots of rooms, pool table, nice open ktichen. Home is large and very well accommodated. This house is amazing! We loved that everyone had their own space/bathroom. Pool table and ping pong were also very fun. Very beautiful house. People were great and very accomodating. Loved the spaciousness and location of house.